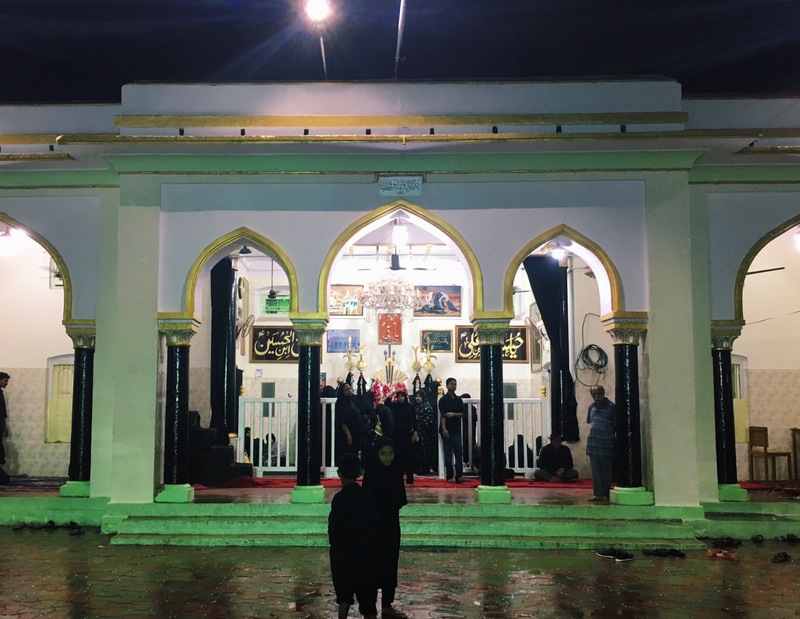 On Thursday evening, we were generously offered by Dr. Anant Maringanti, the executive director at Hyderabad Urban Labs, to observe the Shia community in the city and see some relics during the Islamic holiday, the Mourning of Muharram. This ten day holiday is the first in the Islamic calendar, and the festivities peak on the tenth day, known as Ashura. 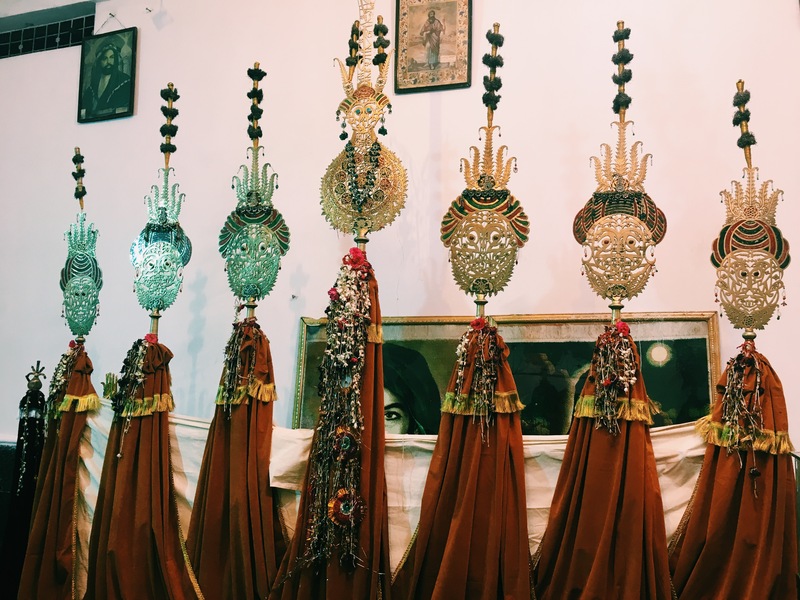 Depending on the sect that Muslims identify with, the significance and celebration of Ashura differ. 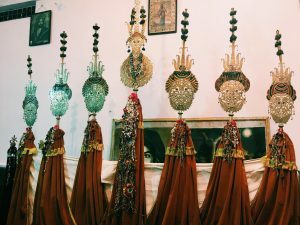 For Sunnis, the importance of Ashura is the divine rescuing of Moses from the Egyptian Pharaoh, and Sunnis usually celebrate this by fasting on the ninth and tenth day of the holiday. However, the Shia community also mourns the loss of Hussain, the grandson of Prophet Muhammad, and his family in the Battle of Karbala. 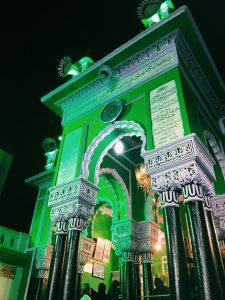 A Shia shrine in the community of Farhat Nagar in Hyderabad, India. Photo by Hannah Metwally. Shortly after Prophet Muhammad died, there was a lot of dispute over who would assume the caliph position, eventually leading to a divergence in the Muslim community. The Shias felt as if the leadership position should remain in the lineage of the Prophet, prompting their selection of Ali, the cousin of Muhammad and father of Hussain. Ali briefly became the fourth caliph of the Muslim community, but was killed. Then, Mu’awiya ibn Abu Sufyan took over as leader of the Muslim community, changing the caliphate to a dynastic ruling. His son, Yazid, succeeded him as caliph, and this caused many angered Muslims to protest, one of them being Hussain. Hussain led an army to fight against Yazid’s ruling, but his army was severely defeated due to the lack of manpower and resources. Now, Shia Muslims from all over the globe annually commemorate Hussain and the other martyrs for standing up against the authority controlling the Muslim community at that time. A Shia shrine in the community of Chavani in Hyderabad, India. Photo by Hannah Metwally. Once we arrived in the older parts of Hyderabad, we were met with the pouring of rain, setting the mood for grieving Muslims. Sitting in the Irani tea shop, I, along with other Muslims dressed in black clothing, waited for the rain to pass. As we waited, we dipped the famous Hyderabadi cookies into our chai. Although the rain prevented us from seeing the procession of worshippers in the streets, we were able to view several shrines dedicated to Hussain’s sacrifice in the Battle of Karbala. 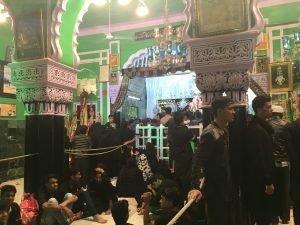 A crowded Shia shrine in the community of Chavani in Hyderabad, India. Photo by Hannah Metwally. We were kindly guided by Anant’s friend, Naqi Mehdi, who grew up in the area and currently lives there. In each shrine that we visited, the steel alams were the main centerpiece. Anant described the alams as war medallions from the battle. In remembrance of those who lost their lives in battle, Shias drape flowers around these alams. Some of these alams were shaped in the form of a hand, which represents Panjatan Paak. 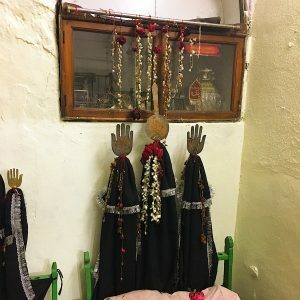 The five fingers on the hand signify the holy members of the Prophet’s family, known as ahl-al-bayt, and includes Muhammad, Ali, Fatima, Hassan and Hussain. Alams inside of a Shia shrine. Photo by Hannah Metwally. 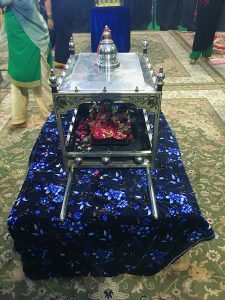 A symbolic casket for Hussain’s six month old baby who died in the Battle of Karbala. This was displayed inside of a Shia shrine. Photo by Hannah Metwally. When we entered the first shrine, I immediately saw a group of women slightly swaying and beating their chest while reciting poems in memory of Hussain. Muslims formed a line with each one pressing their hand or head against the flowers around the alam, saying their prayers. There was a lot of calligraphic artwork displayed on the walls in the shrines, and I noticed a few painted pictures of Hussain as well. 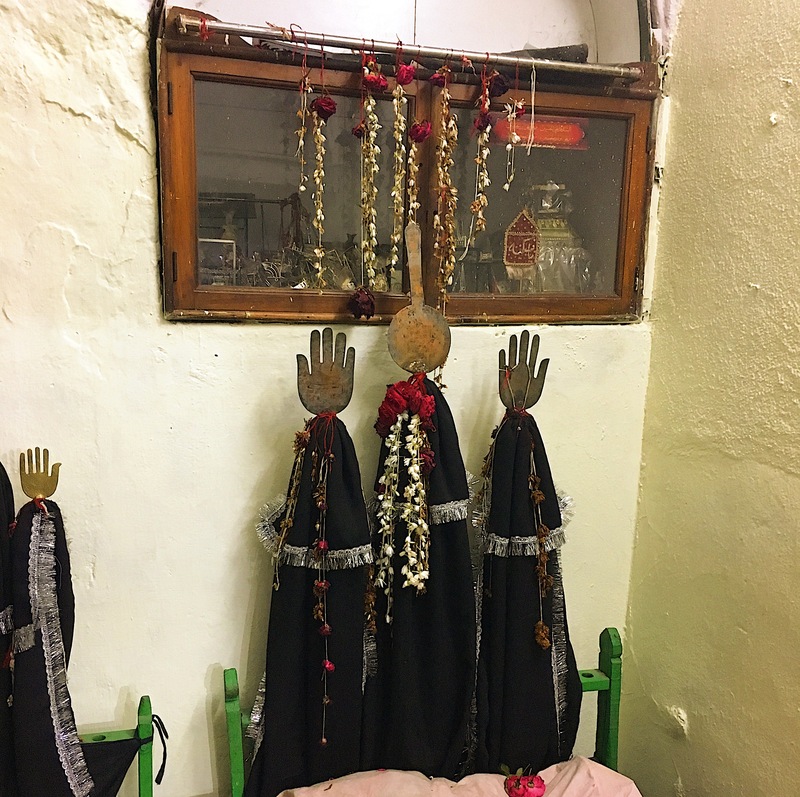 A set of alams inside of a Shia shrine. Photo by Hannah Metwally. 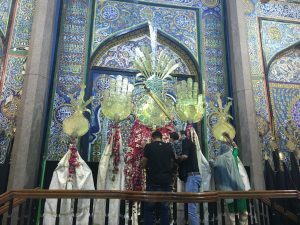 Along with the mourning at these shrines, processions are another ritual performed by Shias to express their deep sadness. Naqi Mehdi informed us of an interesting tradition that happens in the community every Muharram. Hindus are actually the ones who lead the major procession that occurs on the tenth day as a sign of respect and solidarity. Also, some of the Shia shrines have incorporated a few animals with the alams to attract Hindus, especially since Hindu iconography is often packed with animal illustrations. The camaraderie between the two religions has been present in the area for a long time. 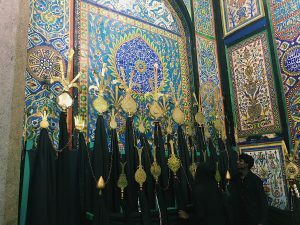 A set of alams inside a Shia Shrine. Photo by Hannah Metwally. As we left the shrines, we walked through the puddles of rainwater and examined the public religious expressions on the street. Stands were set up along the road, giving out free water and chai to anyone who passed by them. Some of these stands were accompanied by green flags, a symbolic way of indicating allegiance to Hussain and his supporters in battle. Loud speakers filled the streets of what sounded like a man in extreme sorrow. I could not understand what was being said at the time, but when I researched more about this holiday, I realized that the speakers were playing poems and elegies in honor of Hussain. Shias praying at the alams in the community of Begum Bazar in Hyderabad, India. Photo by Hannah Metwally. Self-flagellation is another custom practiced by Shias during this holiday to inflict the same sufferings that Hussain experienced in battle. Sunday was when the major procession occurred. During this procession, the men whip themselves with chains. 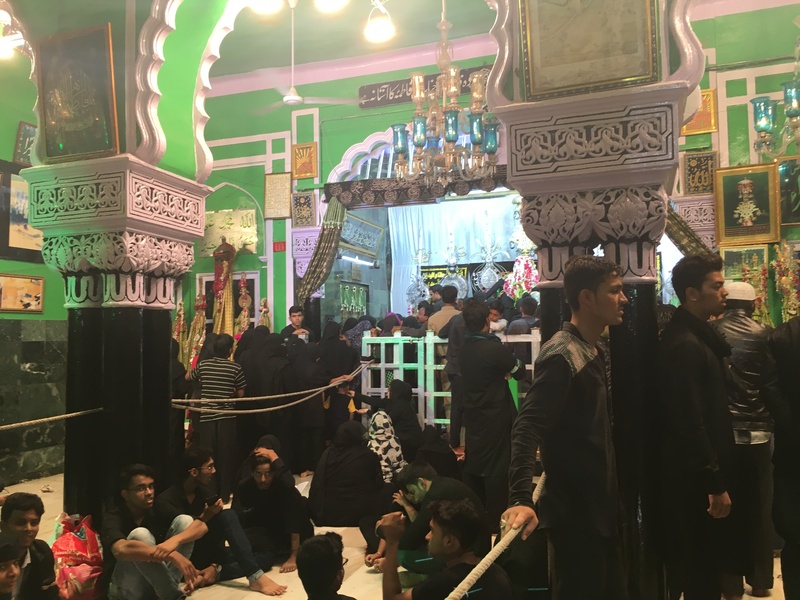 Despite not being able to observe the tenth day of the holiday, I was extremely fortunate to see the insides of a Shia community. 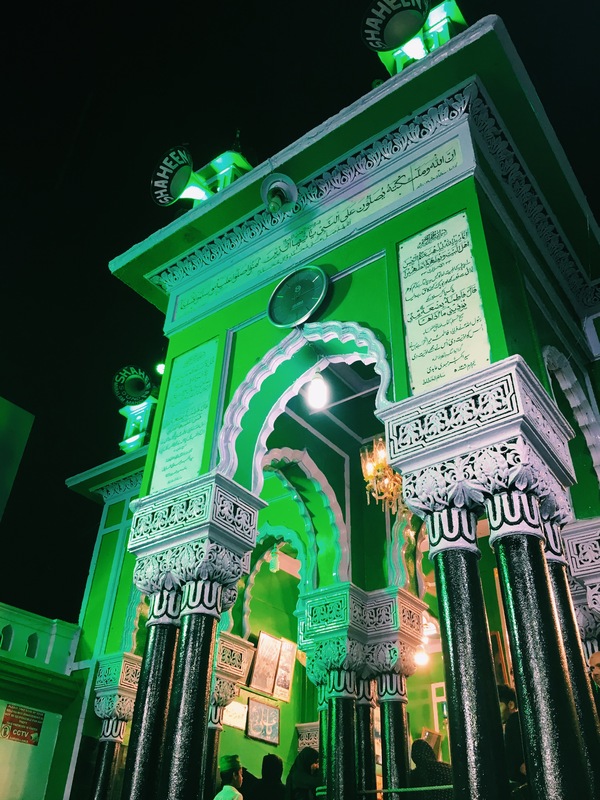 According to an article in News18, Hyderabad is a unique area to observe Ashura because the city houses the second largest Shia population in India, and the author describes the mourning in the city as incomparable. Religious festivals have shaped my experience in Hyderabad; the numerous celebrations and mournings that I’ve witnessed have all evoked different emotions within me and stimulated my senses. The sweet smell of jasmine, the sound of mourning and the sight of elaborate worship spaces have all contributed to my experience in this vibrant city.